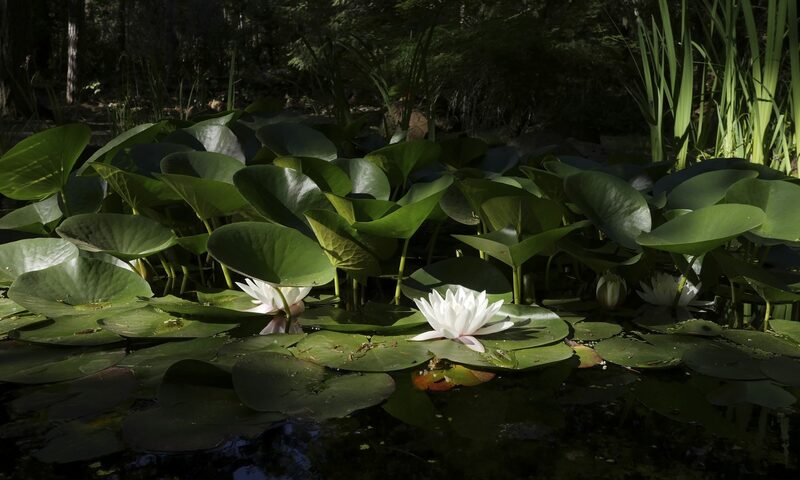 In the Thai Forest Tradition, monks cannot buy, store or cook the food for their daily meal. Because of that, they must rely on people like you and me to give them food every day. There several ways to help. Would one work for you? More participants would help ensure adequate meals and lighten the load for the dozen or so local families that have steadfastly offered alms food for about seven years. With more folks offering, each family could offer a little less or less often and it’d be more likely that there would be sufficient food even if someone moves away or stops participating. 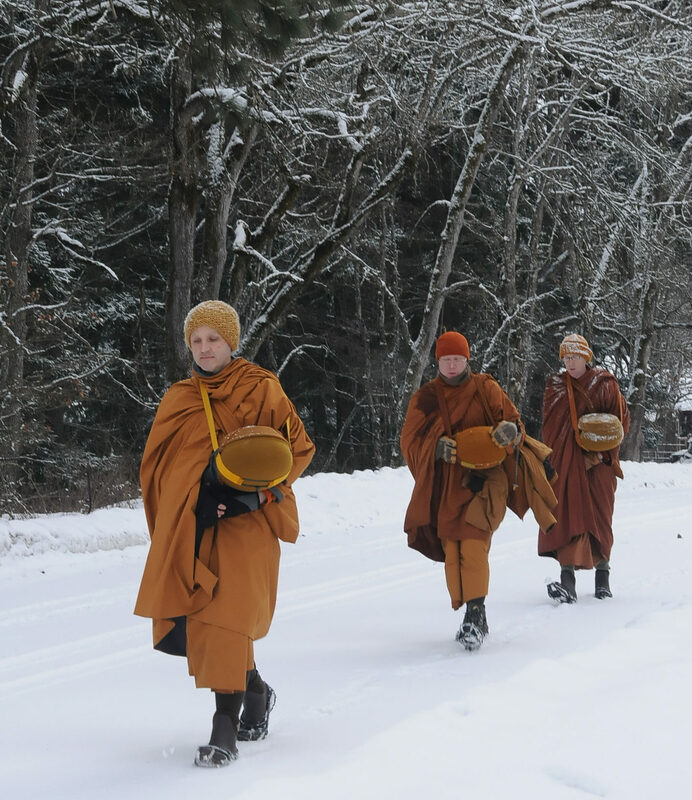 The monks walk alms rounds in White Salmon each morning. Find the current routes here. On weekdays, they rely on this food for their meal. Meet the Monks: Arrange to meet the monks at the P.O., the Grange, a certain intersection, etc. At Your Doorstep: Ask them to stop by regularly or when you put out a sign — ribbon on the door, rock by the mailbox, etc. Bring Food to Someone Else: If you can’t give food to the monks in person, see if someone else can offer your food for you. Let the meal dana coordinator know. Order Food at a Restaurant: If prearranged, the monks can pick up food you’ve ordered. Schedule at least one day ahead with the meal dana coordinator. Give Spontaneously: If you see the monks on their alms round, say “hello” and offer them some food. It’s that simple! On Saturdays and Sundays, meals are brought to the Hermitage. Check the Calendar to find out when meals are needed. Bring a Meal: Bring a meal to the Hermitage by yourself or with a group. Order a Meal at a Restaurant: If prearranged, the monks can pick up food you’ve ordered. Schedule with the meal dana coordinator a few days ahead. Please schedule with the meal dana coordinator. If if no one schedules a couple days before a Saturday or Sunday, she’ll ask someone on the Rescue Squad to provide the meal. These folks sometimes cancel their own plans in order to bring that meal, so let’s make sure we don’t call on them needlessly. If you can’t offer food in one of these ways — including ordering food at a restaurant — you can add to a gift card or tab at certain local restaurants. The meal dana coordinator may use these funds if there are last minute meal cancellations or other difficulties. Please make your offering directly to a participating restaurant. If you have questions or need assistance, please contact the meal dana coordinator. Let’s Find Something That Works for You! Contact the meal dana coordinator (Colleen) if you have questions, want to schedule a meal offering, are a little uncomfortable about offering, or can’t find an option that works for you.